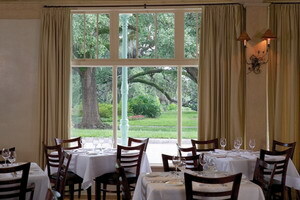 « Homepage / Gourmet / "Lights in the Oaks:Dining with a view of City Park"
Housed in a beautifully renovated building dating back to 1860 that is believed to have been the first concession stand for City Park, Ralph’s on the Park restaurant serves as a romantic setting for experiencing the holidays. This month is the perfect time to dine here due to City Park’s annual Celebration in the Oaks. It is held December 7-30 and features a festival of holiday light displays, musical performances in the newly replanted Botanical Gardens, and Storyland’s fairy tale playground. Before touring the park, you can stop in for the Sunset Dining special from 5:30-7pm for $32 (a three-course menu with a glass of wine). While feasting on such favorites as shrimp and andouille egg rolls, corn and chili-crusted black drum, and blueberry bread pudding, you can watch as the sun sets behind the oaks strewn with a symphony of dazzling lights. 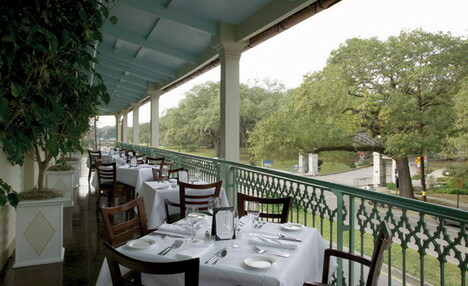 Ralph Brennan’s picturesque restaurant overlooking the park underwent a $4 million renovation post-Katrina and received the highest award for renovation during the New Orleans Historic District Landmark Commission’s awards ceremony in May at City Hall. The renovation featured the demolition of a non-original addition, reconstruction of a gallery, and rebuilding of an entire side elevation. Original architectural elements were layered with new design features including dual color, patterned wood floors, and slanted, glazed beaded board ceilings (Douglas Mouton and Miriam Salas of Camp Architects, and Landis Construction participated in the project). The building was originally constructed as a coffee house and concession stand by a French immigrant. In the 1890s it became a fine dining establishment under Fernand Alciatore, whose father founded the legendary Antoine’s. Around the turn of the 20th century, ladies from the Storyville red-light district added their legendary charms to parties attended by the gents. Adorned with dreamy murals of events once held in this former tavern, the first floor main dining room with one hundred seats is where locals gather for Chef Gus Martin’s delectable contemporary Creole cuisine, while some opt for libations in the popular thirty-seat Alligator Club bar. Private parties are held upstairs in the three dining rooms with a balcony. “The building has such a great history and feel, and is a part of early New Orleans,” says owner Ralph Brennan. “I was honored to bring this building back to its full potential as a landmark restaurant along historic City Park.” As the sun descends, Chef Martin begins preparing some of his wonderful dishes. 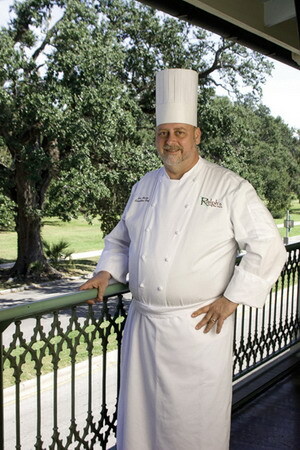 The New Orleans native has a long history with the Brennan family and has worked at Commander’s Palace, Palace Café, Mr. B’s, and Dickie Brennan’s Steakhouse. The appetizers alone are worth stopping in for. Andouille-crusted P&J oysters are flash fried and finished with Crystal hot sauce butter and served with mirliton and peppers; marinated grilled shrimp in chili molasses are fire roasted with peppers and fresh corn and served atop housemade grilled focaccia crust with a smooth Mornay sauce; and gumbo the color of caramel is strewn with Lake Pontchartrain blue crabs, Gulf shrimp, bayou oysters, and Creole country sausage, lingering on the palate with a hint of spice. Recommended among the main course offerings is the cast-iron blackened redfish, served with a spicy crab cake and finished with a rich blue crab butter sauce and a red pepper salad. For heartier fare, try the grilled pork porterhouse with mashed sweet potatoes, onions, and a richly flavored roasted garlic demi-glace, or the grilled ribeye. The tender steak is grilled over an open flame and is smothered with barbecue shrimp made with Worcestershire sauce (prepared by the chef in-house) and Abita Amber beer, accompanied by hefty Asiago and garlic steak fries. It is interesting to note that all the recipes at Ralph’s on the Park are free of artificial and trans fat. “We keep evolving our menu every couple of weeks,” says Chef Martin. 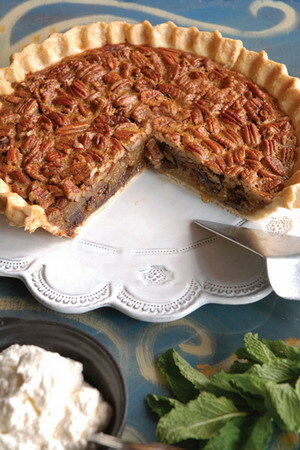 “Louisiana citrus is coming in, such as oranges, satsumas, lemons, and cumquats, which we will be using for desserts during the holiday season.” A new cookbook is coming out in March 2008, authored by Ralph Brennan with Gene Bourg; Kerri McCaffety is contributing the stunning photography. That is something to consider putting on the list for loved ones as a gift for the next holiday season. But for now, try not to miss the lights of City Park this year while enjoying a fine meal at Ralph’s along the way. Here you can write a comment to the post "Lights in the Oaks:Dining with a view of City Park"